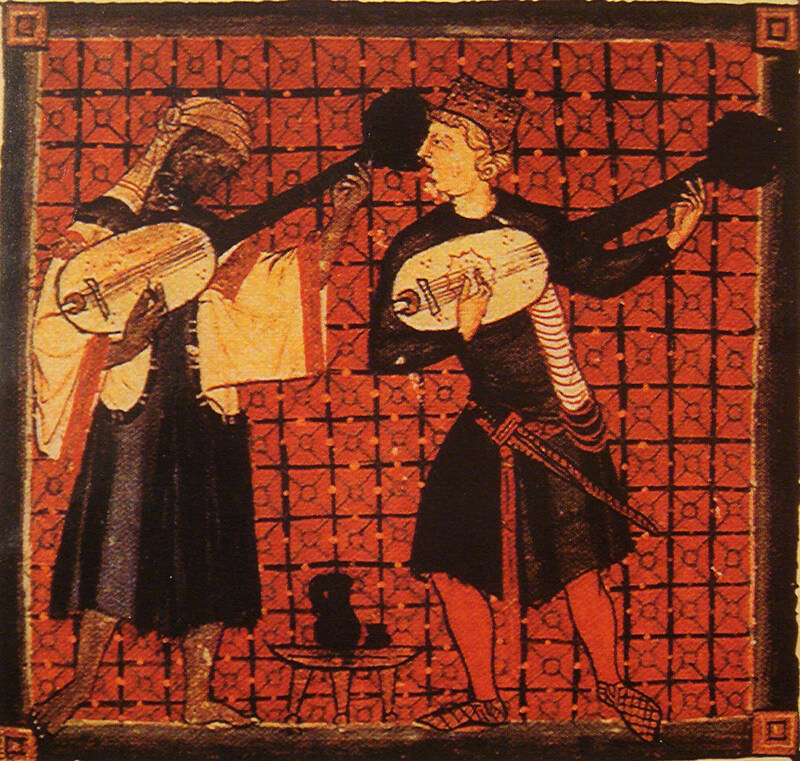 Christian and Muslim playing lutes in a miniature from Cantigas de Santa Maria of Alfonso X (13th century). Public domain. Being able to periodize (that is, divide) the past into blocks of time is an essential historical thinking skill. Historians shape entire narratives based on the decisions they make about periodizing events of the past. In the Lesson 3.2 activity Timelines and Periodization, students get to practice periodization by creating timelines related to a topic many are passionate about: music. My students typically focus on the development of musical genres and musical instruments. To begin, we have students work in pairs (although you could also have them work individually or in small groups) and supply each pair with two envelopes. In one envelope, students find small pieces of paper with music genres/instruments (one slip of paper per genre/instrument). In the other envelope, students find dates (one slip of paper per date). Feel free to steal our template of genres/instruments and their corresponding dates (bonus: the template doubles as your answer key!). Note that you’ll need scissors to cut the paper into smaller slips, placing individual genres/instruments in one envelope and individual dates in the other. Students then research and pair the genre/instrument with the date in which it began or was invented. Ultimately, they place them on a timeline in correct chronological order (a fun extension could be to have students create this timeline on butcher paper and space out the dates to scale). Think about what the items on your timeline have in common. The name of the period should reflect an important theme, person, idea, or event from that era. Breaking history into time periods should help us better analyze it. Sample music timeline: History of the rock band Motörhead showing lineups and albums. Public domain. It is possible to reframe entire stories of the past when we change the names and arrangements of periods to emphasize what we deem important. Historians are powerful influencers of our stories of the past! This activity helps students experience this for themselves, and drives home the necessity of thinking critically about the information we consume.